The Harker Podcast Network has produced a new series to help Harker students make informed decisions about the courses they take, and the site has had around 400 visitors. “We produced this series with the hope of helping students make more informed decisions about the courses they take,” said Arushi Saxena, grade 10. “Apart from a brief description in the Course Catalog and what they hear from upperclassmen, students oftentimes don’t have much to go off of when choosing courses, so these interviews with the teachers of these courses should provide students with a better understanding of each course. 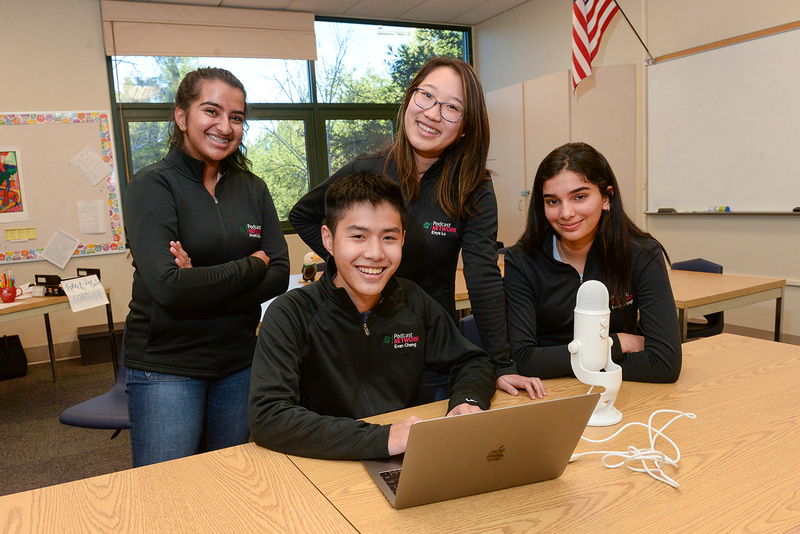 The Harker Podcast Network team of Enya Lu, grade 12, Evan Cheng, grade 11, Larissa Tyagi, grade 11, and Arushi Saxena, grade 10, began brainstorming this series about two months ago, and since then have been writing questions, recording, editing and posting. The series is an ongoing project, “and we hope to add many more episodes on academic courses over the next several years in addition to the 20 we’ve already recorded,” said Evan Cheng, grade 11. “This next month, we also plan to record episodes on all the extra period options, such as Speech & Debate and Principles of Business, as well as the Study of Arts courses like Study of Theater. “Working with Ms. Horan, the upper school academic dean, we’ll get these episodes to the incoming freshman (the Class of 2023) so they can make more informed decisions about their freshman year courses. As a whole, the HPN team is also releasing a Blockchain Decrypted podcast within the next month to help demystify the world of cryptocurrency and localize its application on our very own campus. Podcasts can be accessed either through the web at www.harkerpodcasts.net or through the Apple Podcasts app by searching “Courses at Harker.” The team is working with Horan to add podcasts to the student portal for easier access. The Harker Podcast Network was started in 2014 by the Business and Entrepreneurship Department.